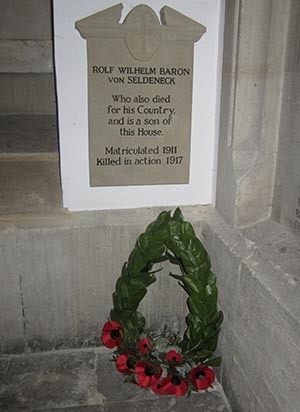 University College has built a new war memorial in commemoration of Rolf Wilhelm Baron von Seldeneck, the college’s only German casualty in either World War. Rolf joined University College in 1911, where he studied for a year, before joining the army in 1914. He was then killed on 24 January 1917, in an area which is now part of Latvia. The memorial was erected just before the 100th anniversary of the Armistice, and was unveiled at the Evensong which took place on the day itself in University College Chapel. The memorial is situated in the Antechapel. After the end of the First World War, a memorial was erected in University College Chapel on which the names of all known members of the College who died in it were inscribed. However, this memorial excluded Rolf Wilhelm Baron von Seldeneck, as he fought for the those at war with Britain. University College was not the only college to have German alumni killed in either of the World Wars. However, many colleges also ignored the names of German soldiers, wishing not to remember them. 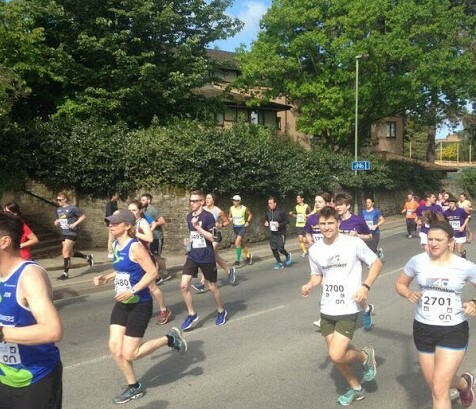 The first institution to change attitude with regards to remembering German casualties of the wars was Rhodes House, which commemorated Germans who died when they built a memorial in the 1920s. New College then followed them in becoming the first college to commemorate these casualties in the 1930s. The memorial was made to look similar to the original one built in University College, and is situated next to it. It was decided not to add his name to the existing memorial, instead dedicating the new one to him. The Evensong saw the names of all past members of University College killed in the First World War read out. This included Rolf’s name. Three wreaths were then laid in the Antechapel, one each for the two World War memorials, and one for Rolf’s. This news comes as Somerville has also introduced new plaques to remember casualties of World War One. They form a memorial to Siegfried Sassoon, Robert Graves and Vera Brittain. Sassoon and Graves were amongst these treated at Somerville when it became part of the Third Southern General Hospital. Vera Brittain, meanwhile, studied English Literature at the college and interrupted her studies in 1915 in order to serve as a Voluntary Aid Detachment nurse.